Just an up-date on things. Hoping to at least go down onto the boat this weekend - its the longest I've gone with her on the river, unattended. The Boat Club does have a 'river walker' - who walks the banks on a daily basis - so you should know if a mooring line goes or something. I was a bit concerned over the rainwater leaking in - not a huge amount. Lena is dry as a bone 'Level' - but when she heels over on the mud - mainly when we have Southerlies, plus rain - which I suppose is not the most common combination. 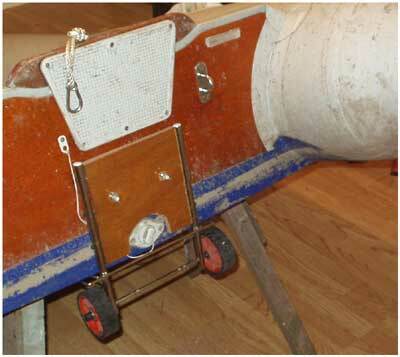 I fitted the extra drainage tubes to the port side cockpit locker drain wells - at the back,. They are just a modified 1/2 copper end feed T-junction - split open along the side, then reshaped to make a saddle that bolts under the drain wells, sealed with Sika - then a 1/2" plastic hose runs out through the cockpit side through plastic thru-hulls. Really - despite heavy rains - it seemed intermittant. I shall find out this weekend, no doubt. Its annoying, as it makes the boat damper than it need be. May go down to the boat tomorrow, Sat, anyway, if just to check it out. ( Didn't bother - weather awful today today - but still hopeful for tomorrow ) That way , if Sun is good, I can concentrate on getting her down the river as soon as she floats and not get side tracked into fiddling with things. Generally on a neap like that, about 2 hrs before - back in one and a half after. So - what else have we be doing. See over - I've just lashed up a set of wheels for the dingy. I happened to have these on an old suitcase trolley. Just held on with two wing nuts. Its mainly for the WBYC Beach launch ramp - which is a very steep wooden affair - especially the last section when the tide is low - and you need to be getting launched minus 3 hrs HW. With the wheels, I can put the outboard on, raised up - load up, etc - then just sail down the ramp and away - lust like a lifeboat launch !! ( In reality - they need to be wider - so they would go either side of the central ' tread battens' ) For just up the river they can stay on - in the water. I'm still hunting for a source of 'lightweight', good diameter wheels - but its a real problem to try to make up a frame without access to welding, etc. I'm thinking maybe 22mm copper water pipe might do ok - as with basic soldering you have cheap fittings - right angles, T's etc. You can always make it stronger by sticking a bit of dowel up through. Went down to boat today - after a six week gap. All ok - especially the rainwater leak. Either my drain tubes have worked, or she's carving out a level mud bed. Not drop in engine bilges - bone dry. Nice sight after six weeks of gales and rain etc. Engine battery flat though - it was the old one of the three ( must be 3 years now ) Checked the electrolyte levels - they were a bit low. Service pair were very good, at 12.5 on the voltmeter - after six weeks, one of which was below freezing. Engine fired up no problem from the service pair - ran it for about an hour - mostly charging engine battery. Maybe new battery for next year ( they are only 30.00 from a local caravan shop - Numax ) In three years that is the first time I've had that first battery dead flat - strange, as they were both about the same on the voltmeter when I left them..
Luckily, the boot was still open and the Honda has an access hole under the rear seat centre console - but its small and I had the dingy on the rear seat. I end up having to clear out the entire boot, lay in boot, gemmy open access hole catch - and flail around with a piece of stick to lift the catch. So much for trying to be careful with the old back ! I've told myself too many times I'm going to tape the spare keys to something under the car - maybe now I'll do it. You never have the spare keys on you when it happens. Happy to see Lena still sitting there like some obedient dog waiting for her master ! So glad the engine bilge is dry. Does not do the engine much good, sitting over a pool of water for weeks. The auto bilge would cut in if it really built up - and the Attwood 1200 pump seems very efficient. I'm also about to get the ply for two stitch and glue tenders. Ideally I would like one on the Pontoons at Uphill - and one on the beach, at the WBYC clubhouse. I have a good little pattern, which I've modified a few times - but it won't come out of under 1 and 1/2 sheets for each - so it going to be four sheets in all. If I use Robbins 6mm Elite - it would be 40.00 a sheet - as opposed to about 14.00 for HW wbp - but the Elite is very light in weight. Also the pontoon dingy would be afloat half the day. About a 100.00 for each is not too bad. Hopefully - Sunday, I'm taking the boat out. I've missed a few opportunities over the last month. When it was fine, the tides were very early - and it was freezing cold, especially for an early start. Two weeks back when they were around midday we did have a couple of good days, but sods law says something is always clashing. So - Sunday - forecast reasonable, at least for a few hrs sail - tide, not that high, neap, about 9m - and about 1230. I think really I may move her up to the pontoon berths at the Uphill Yard soon - but with the pill partially blocked with the wrecked boat - even on the springs you can only get by at HW - and our springs here are always morning and evening. So no chance now of getting out all day, light wise.And once the low tides have kicked in - its awkward to move the boat back down to the river - and its at neaps that we get the midday tides. Then, given a fabulous winter day, hmmm ! - I can always get the boat out from the beach for maybe 3 1/2 hrs. I'll see how it goes - but I do have a load of bits and pieces I want to do, and if she was up on the pontoons I could go down there any time of day, any day I want. At present, I'm trying to get some more sailing in where poss. There is the option to come in in the dark - or go out pre-dawn of course. I was planning to do that a few weeks back - but chickened out. It would in fact have been 'just' on dawn, then back in in daylight. But I've only had the boat out on my own once, so to plan an all day trip, at this time of year, I'm cautious. Really - I must just stop looking too hard at the weather forecasts. For a few hrs out it really does not matter, unless it 'really bad'. Most days would have been a bit chilly, force 5 and maybe a bit of rain - the culprit, really, is too warm a bed for a 7 am start - rather than too bad weather !! Still - I am trying to sail the boat in November - not the most ideal time of year. If you are interested in such things - you may notice I've just altered how the links are displayed. This is done quite simply by adding the necessary stuff to the style sheet - so if you want to see the style sheet that's referenced to this 'sailing' section see here- notice the no underline - then red with underline on the mouseover. I'm just having to fiddle with it as I've just loaded Mozilla/Firefox as a browser - and at first it would not read this right - think its sorted now.